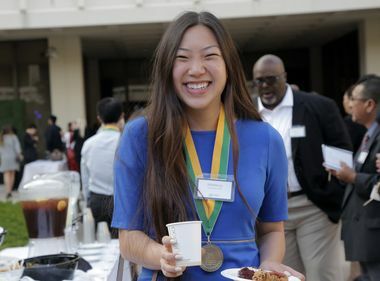 Irene Tang, a South Pasadena High School senior, shows off the medal she received as a 2015 Edison Scholars award recipient. Francisco Martinez, SCE Local Public Affairs region manager, presents Irene Tang, a South Pasadena High School senior, with an enlarged $40,000 Edison Scholars check. 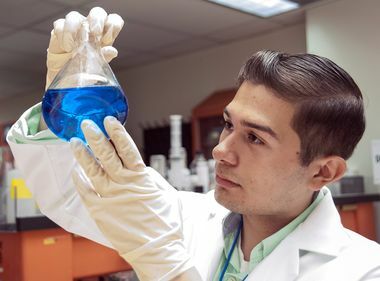 Isai Rea, a senior at King Drew Magnet High School of Medicine and Science, holds an enlarged copy of the $40,000 check he received as a 2015 Edison Scholar. Tammy Tumbling, SCE director of Philanthropy and Community Investment, gives Irene Tang her medal for her 2015 Edison Scholars award during a presentation at South Pasadena High School. With the recent news of her $40,000 Edison Scholars award, Irene Tang will soon head to Swarthmore College. When Irene Tang’s father had a stroke a few years ago, it brought her college plans into focus. She always liked math and science, but her father’s illness, followed by a second stroke last year, set her on a course to pursue biomedical engineering. Irene won a coveted offer to attend Swarthmore College, a small private school outside Philadelphia. But tuition, room and board runs nearly $60,000 a year. 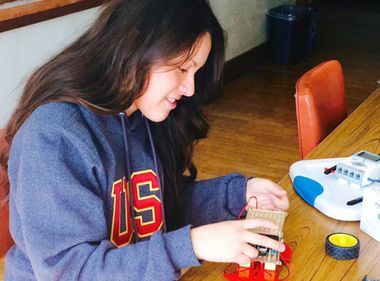 Edison International, parent company of Southern California Edison, gave Irene’s plans a major boost when she recently received a $40,000 Edison Scholars award. Irene is one of 30 high school seniors in Southern California selected for this year’s scholarships. The program is aimed at underrepresented minority and low-income students. To be eligible, the applicant must have at least a 2.8 grade-point average and plan to major in STEM — science, technology, engineering or math. This year, 2,768 students applied, an 86-percent increase over the 1,491 last year. An unsuspecting Irene learned the news during her noon-hour Advanced Placement biology class. She said she thought it was a little odd to see the photographers and a video crew in her classroom, but really didn’t give it any thought until Tammy Tumbling, SCE’s director of Philanthropy and Community Investment, strode into the class and called Irene to the front of the room. Irene’s mother, Judy, attended the surprise class presentation. She said she always knew Irene was headed for great things because of her curiosity as a little girl. She always followed her father, an engineer, around, pestering him with questions. It was Francisco Martinez, SCE Local Public Affairs region manager, who first called Judy about her daughter’s selection as an Edison Scholar. Another surprise visit took place at King-Drew Magnet High School of Medicine and Science where senior Isai Rea learned the news about his scholarship during his Advanced Placement calculus class. Isai hopes to pursue civil engineering at the University of California, Berkeley. “It is like a symbol of all the hard work I’ve put in and then I’ll take it with me to my dorm so I will remember that I am going to graduate in four years without any student loans,” he said after receiving the check. “That is going to be amazing."